They say in the beauty industry your brows are ninety percent of your look. Well, look no further than Nicoleta Barbarasa at Brighton Salon in Beverly Hills. She is the best of the best at brow shaping and she gave us a brow tutorial just in for the New Year! 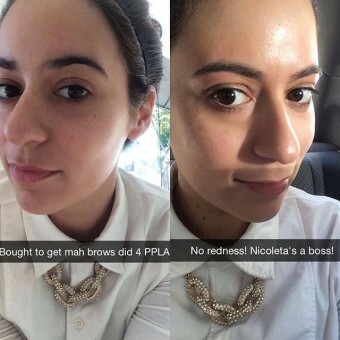 A non-believer in thin brows, Nicoleta works her magic to perfectly shape your best brows in coordination with your bone structure. With over 20 years of experience in the beauty industry, she actually began her career as an aesthetician. You can rest assured that you are in the very best of hands when you come in for your appointment at Brighton Brows. Additionally Nicoleta has also developed her very own skincare line for waxing. The products she applies are meant to soothe and are effective even with the most sensitive of skin types. No worries of red bumps when you are in her capable hands! Make sure to stop in and mention Press Pass LA sent you for the VIP treatment from brow wiz extraordinaire Nicoleta. Don’t miss out on having the perfect brows for New Years Eve! You’re sure to become a brow addict after just one session with her. We did!